CAL FIRE Local 2881 and CAL FIRE are saddened to announce the loss of one of their own. 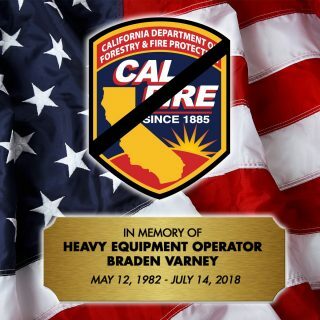 CAL FIRE Heavy Equipment Operator Braden Varney died July 14, 2018 while working to prevent the spread of the Ferguson Fire in Mariposa County. Brother Varney was 36 years old. A second-generation firefighter, Brother Varney had worked for CalFire for 10 years. His father also worked as a CalFire heavy equipment operator. Members of the fire service are invited to the Celebration of Life for Heavy Equipment Operator Braden Varney on Monday, July 23, 2018 at 11:00 A.M.
Attire: Class A Uniform. For those who are not required to wear a Class A uniform, a long-sleeve work uniform with tie is required. All uniformed personnel are required to arrive no later than 9:30 A.M. the morning of the service. All Honor Guards are invited to participate. Please contact Bobby Brothers at (916) 672-1444.